I just finished cutting The Beatles on Ed Sullivan. 11×14 inches. Pegas 2/0 spiral blades. Pattern designed by me using GIMP2. No stain or finish on it yet. That is really nice!! GREAT job!!! Wow! Totaly realistic! How you managed to keep all those thin parts together, not to brake them!? Great job. Sure brings back a lot of very fond memories. Another picture very well done. I always smile when I see a picture of the Beatles from when they first started out. My dad would not let me watch them with their “silly” long hair… He should have seen groups that followed! The Beatles looked like nice clean boys from next door in comparison. You did a beautiful job on this piece. 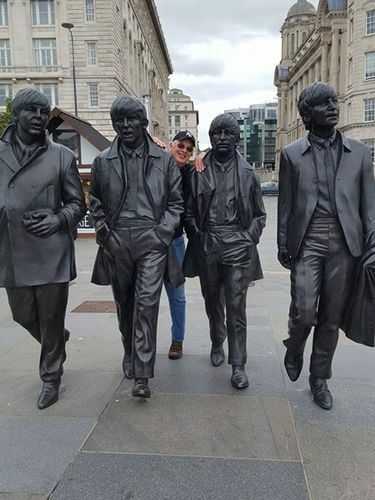 That can’t be the Beatles…. I don’t hear any shrieking teenage girls. They premiered on Ed Sullivan on February 9, 1964, opposite The Legend Of Sleepy Hollow on Walt Disney. I know, because I was 6 and I didn’t care about the Beatles; I wanted to see the headless horseman. I was voted down, because my parents and everybody else on the planet wanted to see the Beatles. Love your Beatles Scroll saw project ! I have just relocated to Liverpool and will be opening my new workshop here late September.